Agriculture contributes significantly to greenhouse gas (GHG) emissions including CO2, CH4 and N2O. The recent International Panel on Climate Change (IPCC) synthesis report on climate change (IPCC, 2007) indicates that agriculture contributes 13.5% of the 49 Gigatonnes (Gt = 109 t) of annual global GHG emissions due to human activities in 2004. 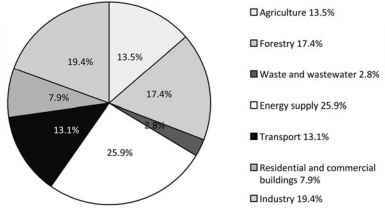 Figure 10.1 shows the contribution of various sectors of human activities to GHG emissions in 2004. Note that agriculture is separated from forestry, which also includes deforestation. 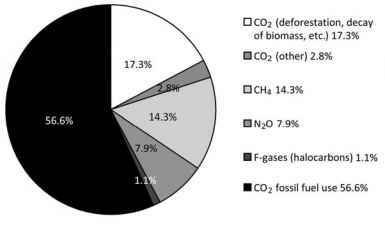 CO2 was the major anthropogenic GHG with 77% of emissions in 2004 (Fig. 10.2). CH4 (23 times global warming potential (GWP) of CO2) and N2O (310 times GWP CO2), when expressed in terms of CO2 equivalents, accounted for most of the additional 23% of anthropogenic GHG emissions. Agriculture contributes about 50 and 70% of total anthropogenic emissions of CH4 and N2O, respectively (IPCC, 1996). Fig. 10.1. Percentage contribution of different human interventions in greenhouse gas emissions in 2004 in CO2 equivalents (adapted from IPCC, 2007). Fig. 10.2. Percentage contribution of different anthropogenic greenhouse gas emissions in 2004 in CO2 equivalents (adapted from IPCC, 2007). evaluate the atmospheric CO2 mitigation capacity of different farming practices, C sequestration in soil, C storage in crop residues, as well as CO2 emissions from farming activities should be considered together (Wang and Dalal, 2006). To include farming activities, estimates must be made of energy use and C emissions for primary fuels, electricity, fertilizers, lime, pesticides, irrigation, seed production and farm machinery (West and Marland, 2002). CH4 emissions come from natural and human activity and have a total value of 528 Tg/year (Tg = 1012 g), with human activity CH4 estimated to be 370 Tg/year, the major contributors being anaerobic rice cultivation (80 Tg/year or 22%), enteric fermentation in animal production (93 Tg/year or 25%) and burning of biomass (40 Tg/year or 11%) (Houweling et al., 1999). Enteric fermentation in animals is an important consideration as nations get wealthier and their populaces demand more meat products (Verge et al., 2008); however, this falls out of the scope of this chapter and will not be discussed. 2003 (US Emissions Inventory, 2006) with 67% of these N2O emissions coming from agricultural soil management. N2O emissions are related to denitrification of nitrates in soils under wet and anaerobic conditions. Published papers report both increasing (Mackenzie et al., 1997; Ball et al., 1999) and decreasing (Kaharabata et al., 2003; Drury et al., 2006; Patiño-Zúñiga et al., 2009) N2O emissions with various management options on various soil types. This is an important topic to discuss because any gains in reducing CO2 emissions with conservation agriculture (CA) must not be lost by increased N2O emissions. Promoting agricultural practices that mitigate climate change by reducing GHG emissions is important, but those same practices also have to improve farmer production and income and buffer the production system against the effects of changes in climate. The overall impacts predicted by climate change models vary, but we are now locked into global warming and inevitable changes to climatic patterns that are likely to exacerbate existing rainfall variability and further increase the frequency of climatic extremes (IPCC, 2007). Where excess rain occurs, extreme rainfall events will increase leading to flooding and soil erosion. In low rainfall, drought-prone areas, there is general acceptance in the science community of more frequent moisture stress because of failed rainfall patterns and increased evaporation caused by higher temperatures (Cooper et al., 2008). In Africa specifically, the projected combined impacts of climate change and population growth suggest an alarming increase in water scarcity for many countries, with 22 of the 28 countries considered likely to face water scarcity or water stress by 2025 (UNECA, 1999). This in turn will curtail the ability of irrigated agriculture to respond to the expanding food requirements of tomorrow's Africa. This raises the spectre of a worsening food security crisis (Rosegrant et al., 2002). Evidence of changes in climate extremes, in particular of temperature, is already emerging in southern and West Africa (New et al., 2006). Ortiz et al. 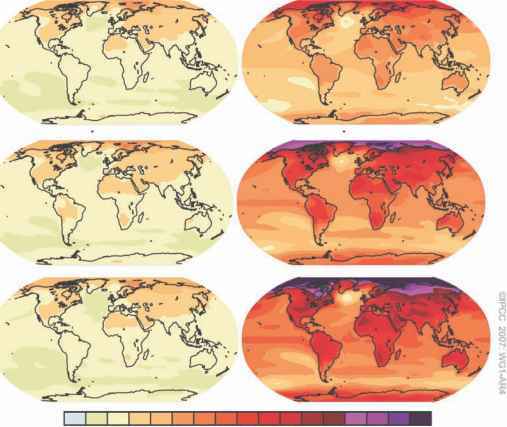 (2008) modelled the possible effects of temperature change on wheat productivity in the major wheat-producing environments of the world. Their climate scenarios suggest that global warming may be beneficial for the wheat crop in some regions, but could reduce productivity in zones where optimal temperatures already exist. For example, by 2050, as a result of possible climate shifts in the Indo-Gangetic Plain - currently part of the favourable, high potential, irrigated, low rainfall megaenvironment - as much as 51% of its area might be reclassified as a heat-stressed, irrigated, short-season production megaenvironment. This shift would represent a significant reduction in wheat yields; the Indo-Gangetic Plain accounts for 15% of global wheat production. In order to cope with the increased climate risk, agricultural systems will have to be more robust and resilient to buffer for extreme weather events such as drought, flooding, etc. It is paramount that new agricultural practices not only prevent further soil degradation but also improve system resilience through increased soil organic matter, improved water-use efficiency as well as nutrient-use efficiency, and increased flora and fauna biodiversity. However, the management of agriculture to cope with GHG emissions and the negative effects of climate change on food production lies in the hands of farmers, pastoralists and forest managers whose decisions are determined by multiple goals. In this chapter we will discuss the promotion, extension and adoption of agricultural practices like CA that mitigate by reducing GHG emissions and help adapt to climate change. The major potential for CA as a climate mitigation strategy is based on its related agronomic and economic productivity gains. The additional benefits from the partial or full adoption of CA are generally substantial even in the absence of incremental profits arising from market or subsidy payments for soil conservation or GHG mitigation credits. CA has that win-win combination of being a soil and water conservation technology that can also increase productivity. Higher yields in wheat and maize (Govaerts et al., 2005) are the result of an increase in soil quality, especially in the topsoil (Govaerts et al., 2006b). Increased aggregation and soil organic matter at the soil surface lead to increased water- and nutrient-use efficiency (Franzluebbers, 2002) as well as reduced soil erosion (Verhulst et al., 2010). The increased production and profitability can be the major driving factor for farmers to implement CA and thus, go beyond ineffective and expensive direct incentives (Govaerts et al., 2009a). This chapter will discuss in more detail some of the benefits of CA and explain why it is important for future food production while at the same time helping to buffer against global climate change.